Ribbed green foliage, violet flowers. Here we offer five of the most popular Hosta varieties, the professional landscaper's favorite for use in shade. 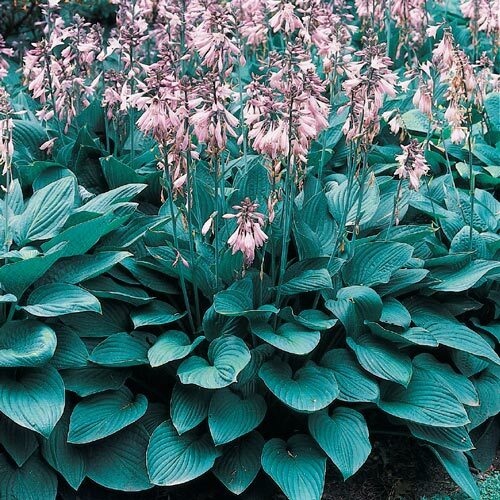 Unequaled for their handsome, broad, ribbed, wavy foliage in many colors and their fragrant bell-shaped flowers. Ideal for naturalizing, providing sparkling color for years and years. Dig a hole large enough to accommodate the roots without bending them. Firm soil around roots and water in well. Tolerant of a wide range of soils, but best in well drained. Remove spent flower stems to tidy up the plants for the rest of the growing season. Mulch +/- 2" for the first winter. Remove promptly in early spring.